It's never too early to prep for the year ahead. The winter chill may just be retreating and spring setting in, but you can begin planning your wardrobe for 2011's fall-winter by checking out the trends at the recent menswear shows in Milan and Paris. Fall is fur real: From shearling to mink-either as trimming, collar components, full-weight jackets or head gear-fur was present in every form in the collections of Balmain, Alexander McQueen, Burberry Prorsum, Etro, Louis Vuitton and Kenzo. Colourbar trumped as solid hues announced their arrival. Red ruled at Dolce & Gabbana and Alexander McQueen while Burberry's (left) outerwear was eye-popping in yellow, red, orange and royal blue. Paul Smith sent out a showstopping mustard-coloured duffle coat while Jil Sander experimented with suits in pinks and green, and jackets in the brightest tangerine. Move over, navy. The 1950s are for keeps. Giorgio Armani employed soft tailoring of double-breasted jackets and wide trousers in a predominantly grey palette while Emporio Armani's urban yet conservative collection had asymmetric collared jackets and super long coats. Prada's retro collection with flowing lines also stayed true to the period. Retro redux. 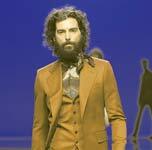 Roberto Cavalli's men walked out of the '70s with ultra-fitted three-piece suits, silk shirts accessorised with foulards, necklaces and trousers flared at the bottom. The Gucci guy too gave off the early '70s rockstar vibe with wide lapels and trouser legs that flared arrogantly over the shoe. That's what we call groovy. Hats are tricky. Get it wrong and you look as out of place as a penguin in Bora Bora. Lanvin had sophisticated Fedoras while Dior Homme practiced monastic restraint with widebrimmed hats inspired by Amish men. Givenchy played along with furry hats with stand-up ears-in sync with the theme of Rottweiler printed dogfights on the clothes sent out by chief designer Riccardo Tisci. Back-to basics-minimalism and purity of vision was apparent in all the collections. Jil Sander had plain, felted square-cut suits-three buttons, high closing-paired with similarly shaded tops, while Prada teamed wide coats with narrow, slightly cropped pants and staid sweaters updated in sparkling lurex. Emporio Armani's (right) collection in shades of grey and taupe offered unstructured, slim coats that resembled cardigans. Easy and elegant. Can't ask for more. One of the quirkiest trends to emerge from the fall collections in Milan was the Vshaped silhouette. Prada showcased striking geometric V patterns on sweaters while waistcinching cuts were very evident in Versace. Very flattering. Worth exploring, fellas.